The new-gen Ertiga, launched on November 21, 2018, in one of the most popular MPVs besides the mighty Toyota Innova. In fact, the Maruti Suzuki Ertiga was the first vehicle to establish the compact MPV segment in India and went on to become a successful vehicle. Having first forayed into the Indian market in 2012, the Ertiga had all along enjoyed significant popularity amongst car-buyers but of late, it grew to be a bit boring and dull in terms of competitiveness. The makers felt a need for an overhaul, and the latest version is based on the HEARTECT platform. It is also accompanied by an array of new features, besides promising more space and a fresh design. What now needs to be found out is, whether the new Ertiga is yet another lacklustre MPV or is it any different which makes it a good pick at this price point. It is also interesting to note that Maruti Suzuki has been on a roll as the automaker has been offering quality products, one after the other, and the latest one to come out of their stable is the new Ertiga. The good news is, it looks nowhere close to the Swift. A lot of effort has been invested in terms of its styling, and that clearly reflects! The new Ertiga is now bigger, and bolder. In terms of the exterior, the highlight is in the front, which looks straight out of a car and looks impressive. The chrome studded grille is a first in this price segment and has been tastefully done to lend a premium look to the vehicle. The grille is flanked on either side by sleek headlamp units with projectors that infuse a decent dose of sharpness to the design and also ensure good illumination. You can also expect a new hood and smart looking bumper. The front too flaunts a revamped look and comes with some desirable elements. The side profile will leave a long-lasting impression, primarily since it is longer than its predecessor. However, the strong shoulder line running from the tail lamp up to the front accentuates the length and the new alloy wheels play a key role in offsetting the visual fatigue of length. The rear too has undergone a complete makeover, with the centre-stage being taken by the vertically stacked tail lamps. They bear a close resemblance to Volvo SUVs which is not a bad thing. The overall design is further complemented by the sharp lines on the boot lid and the bumper. The new Ertiga is a good-looking vehicle, younger, smarter, and appealing, both from the front as well as the rear, which will appeal to the younger customer base. The cabin is also new, with the dashboard having a lower beige part and a darker top, intersected by a good-looking wood finish. The AC vents get an effect of running across the dashboard, which creates visual differences from other Maruti vehicles. Also, the fact that the company has undergone considerable manufacturing progress in recent years is reflected in the material as well as fitment quality. The SmartPlay infotainment system is the same as seen in other Maruti cars and the touch-screen is quite easy to use and responsive. The bezel or the border around the screen, however, is quite thick. With a slimmer profile would have added more elegance and premium appeal. The flat bottom steering wheel is also a first for the Ertiga. You can also expect audio and phone controls. However, the fact that it gives a miss to cruise control on the top variants is a disappointment, considering many buyers will use this car frequently on highways. The cabin also boasts of smartly integrated storage space, which adds to the convenience of front and rear passengers. 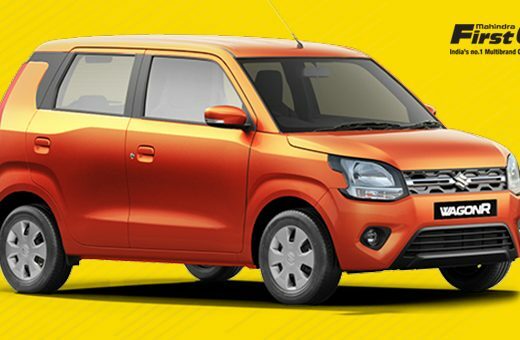 The seats too are quite good for its segment upfront and even tall occupants can enjoy great comfort on long drives. In the middle row, the legroom is the same as the older model, but the width of the bench has changed. Hence, the occupants can now enjoy more shoulder space and thanks to the low transmission tunnel hump, three people can be comfortably accommodated. There is also ample headroom, and the overhead air conditioning vent adds to the comfort and convenience at the rear. Even in the rear door pockets, you can place a one-litre water bottle. The cabin also promises an armrest for added convenience. Also, the almost flat floor ensures that a third occupant can sit decent comfort. If you are buying a seven-seater, it goes without saying that the third row will make a lot of difference to you, however, most MPVs leave you a little disappointed on that front. The best part is, you can fold the middle row and push it forward with just the flip of a lever. With relatively easy ingress, your knees may feel pressed against the front seat, which can get uncomfortable. However, since the middle row seat travel is adjustable, it can be pushed forward to free up more space. Under thigh support is not adequate, but it is better than some other MPVs in the market. Overall, the third row feels decent but is still more suitable for a brief period and is not that great for long drives. Also, it is not advisable to seat your children in the last row, as it is wrong and unsafe. Make sure that children below 12 years sit only in the middle row in a child car seat. Unlike the front, the rear is devoid of sufficient crumple zones, which poses higher risks for children. Thanks to the extra length of new Ertiga, you can also enjoy increased boot space and with the third row up, the boot volume has gone up by about 50% so you get about 209 litres with all seats up. If you fold both rows completely down, you can get 803 litres of boot space. As far as engine and gearbox are concerned, the biggest change is the new Maruti Suzuki Ertiga promises the inclusion of a new 1.5litre petrol engine, which had made its debut in new Ciaz. It is in a similar state of tune, developing 104hp and 138Nm of torque. The engine also comes updated with SHVS technology, which also was previously seen in Ciaz. It comes with a lithium-ion battery, which results in higher output and efficiency. The system stores braking energy and it uses it back at the time of acceleration which Maruti Suzuki terms as a Torque Assist. Buyers can enjoy higher fuel efficiency. The motor functions quite smoothly and has adequate power to move around the vehicle with ease. Even on the highways while overtaking the long trailers there is ample power on tap. There is also another engine option, which is the tried and tested 1.3litre diesel engine with a manual gearbox only. When it comes to noise vibration and harshness levels, the insulation is not exceptionally good, but not very bad either. It is at a point where sound that filters into the cabin will not bother you. That being said, slight improvement could have made as far as the decibel levels are concerned. The 5-speed manual gearbox is quite efficient, and the automatic transmission delivers a satisfactory job, though it is primarily aimed at buyers who are targeting urban use. gearshifts happen at a reasonably good pace but prospective customers might give a miss to the option to shift manually. Coming to ride and handling, a lot of changes have been incorporated to the suspension and the rear is equipped with a plethora of components. These changes have resulted in better ride quality, even with bad road surfaces and minor undulations. The cabin stays largely insulated from these shocks. Even at high speeds, the ride quality is quite up to the mark while the handling is pretty much neutral. The Ertiga will not do much to delight driving enthusiasts and it is not intended to go around corners quickly. So if you are talking about daily and practical uses, triple digit speed ability as well as braking are up to the mark. With regard to family and adventure usage, the Ertiga checks all the right boxes in pretty much all the departments. Maruti Suzuki Ertiga is no less than a winner when looked at from an overall perspective. It boasts of impressive looks, spacious cabin, good features, a smart infotainment system and it also drives and rides well. It is priced at between Rs. 7.44 lakh and Rs. 10.90 lakh. It comes with a plethora of features across the variant range. Though it is being compared to the Mahindra Marazzo, this car does it have any direct rivals. It is a vehicle from a different segment, a slightly more premium vehicle and till the time it gets a match similar to it in the domestic market, it will reign supreme in terms of sales, building further on the success of the older model.